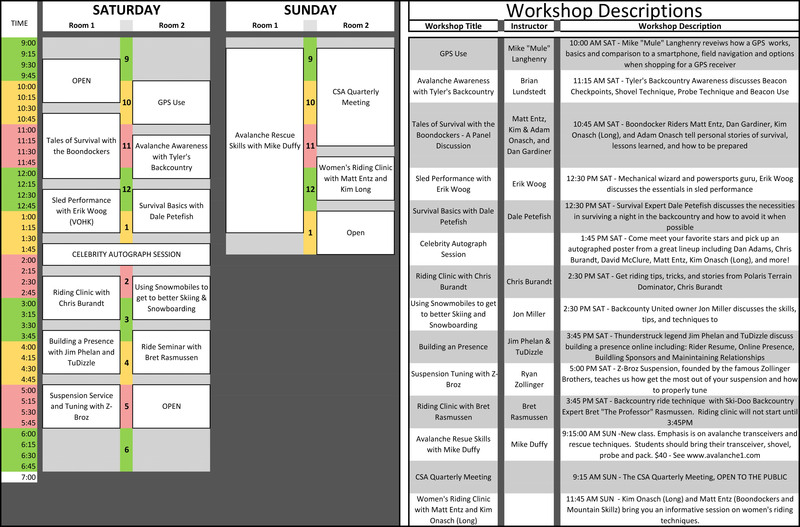 With sled season just a few weeks away, I just wanted to share the workshop schedule for the 2016 Rocky Mountain Snowmobile Show! I also want to thank the presenters for their continued commitment to the advancement of the sport and for the volunteering of their time. Each of them have given up an hour or more, despite paying for a booth, to come and teach us how to better utilize our machines and enjoy the sport! Thank you, to each of you! New this year, The Boondockers will spend 90 minutes, in a panel format, explaining sticky situations they’ve been in, and how they safely got out. Expect to hear tips on useful gear, techniques, and general knowledge. The session will complete with a Q&A. Also, Mike “Mule” Langhenry will present a 60 minute lecture on GPS use, navigation technique, tips and gear. Finally, Jon Miller of Backcountry United will present a focused panel on using snowmobiles to get to better skiing and snowmobiling. Mr. Miller will discuss technique, gear, and tips to make Hybrid-Use more enjoyable for everyone! Returning, will be Erik “VOHK” Woog, renowned sled mechanic. The man behind some of the most prominent backcountry machines in the West will review performance and maintenance. Also, Jim Phelan of Thunderstruck and Brandon “TuDizzle” Cox will discuss building an audience and presence online. Topics will include the construction of a resume/website, professional online behavior, and building and maintaining sponsor relations. Mike Duffy will again present his Intro to Avalanche Education. There is a $40 fee for this class, and participants must register with Mr. Duffy prior to the clinic. You can reach Mr. Duffy via text or phone call (970-390-9433) or via email duffyww1@aol.com. Chris Burandt will also present a 60-minute riding seminar, and will answer questions! Bret Rasmussen will discuss backcountry technique. Ryan Zollinger from Z-Broz racing will review suspension modification and settings, and will help determine what settings may be best for you! Also returning this year will be a women’s riding clinic presented by Matt Entz and Kim (Long) Onasch. Brian Lundstead of Tyler’s Backcountry Awareness will present the beacon checkpoints, beacon use, and other avalanche techniques. Finally, Dale Petefish will present on backcountry survival tips! As you can see, this is a great opportunity to brush up on your skills and become a better rider. Make plans now to attend your favorites! All workshops are first come, first served.